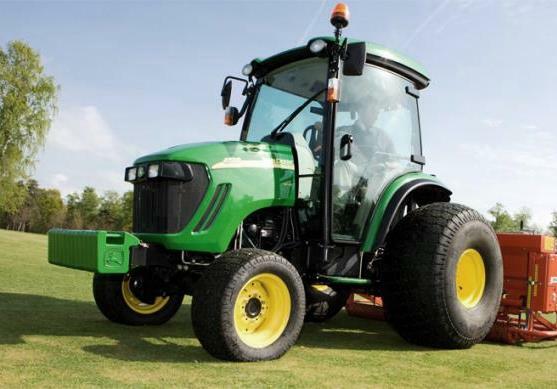 - Nine forward speeds are available when using range and gear shift levers. - Three reverse speeds are available when using the range shift lever. Slow speed gearing (creeper) is available as an option. It provides a fourth speed range. To prevent unnecessary wear, never "ride" the clutch by resting a foot on the pedal. Gear (1, 2, 3) and direction shifts (forward and reverse) can be made on-the-go, without stopping. Release clutch pedal gradually to take up load smoothly. 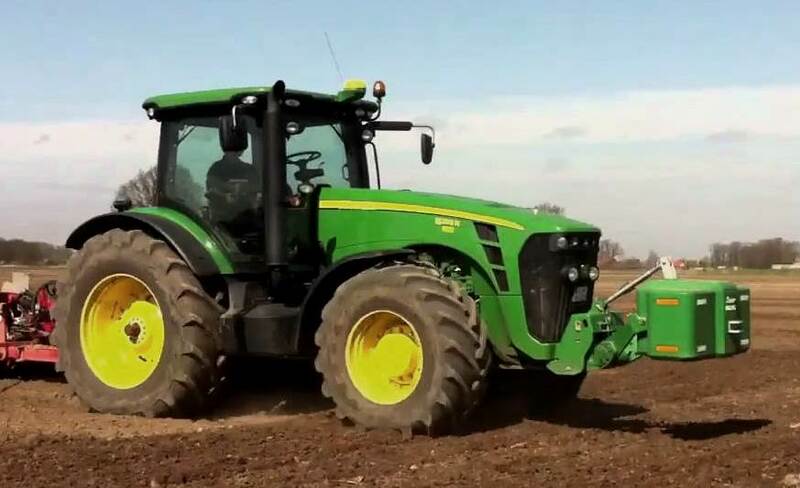 Leaving transmission in gear with engine stopped will not prevent tractor from moving. Put transmission gear shift lever in PARK and electro-hydraulic directional reverser lever in NEUTRAL before dismounting. Gear shift lever provides four forward travel speeds (1, 2, 3, 4) and reverse. Range shift lever provides three speed ranges. Electro-hydraulic (EH) directional reverser lever provides travel direction (forward or reverse). When using range and gear shift levers in different combinations, 12 forward and reverse speeds are available. Slow speed gearing (creeper) is available as an option. 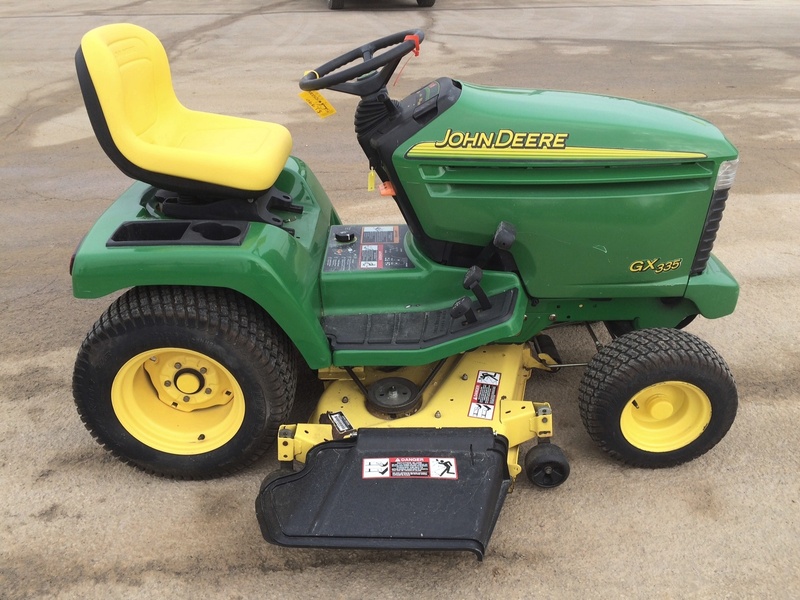 - When starting 5525, 5325, 5425, 5225, 5625 John Deere tractor, put EH directional reverser lever in neutral and cycle clutch pedal one time to disengage the engagement override valve. To prevent unnecessary wear, never "ride" the clutch by resting a foot on the pedal. 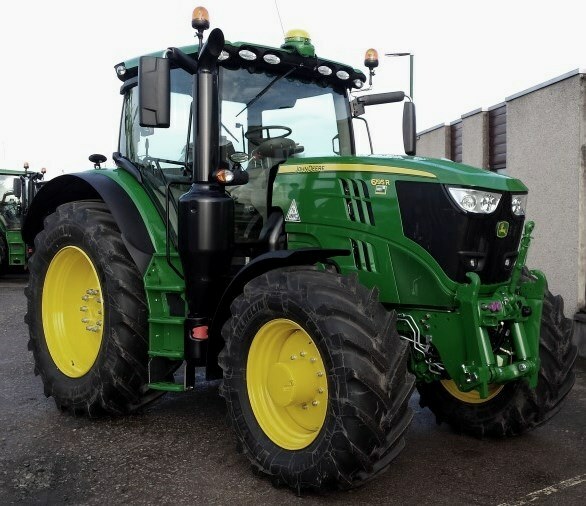 - Depress clutch pedal and stop tractor before shifting range shift lever. - Use EH directional reverser lever to select travel direction. You can change travel direction without depressing the clutch pedal. - Depress clutch pedal when shifting gears. Gear shifts (1, 2, 3, 4) can be made on-the-go, without stopping. Release clutch pedal gradually to take up load smoothly. The Neutral Indicator lights when gear shift lever and EH directional reverser lever are both in neutral. The indicator light will go out when the gear shift lever is put in PARK. The indicator light will flash if the gear shift lever is in Neutral and EH directional reverser lever is in forward or reverse. The Information Indicator lights if a malfunction is detected in the transmission. - In full left (counterclockwise) position (as shown), load take-up and acceleration ramp-up are slow to respond. - When operating with high load and ballast, turn control knob clockwise to acceleration and load take-up response. - Premature tire wear can occur when operating in full right (clockwise) position on concrete or paved surfaces. Creeper Gear Operation - A slow-speed creeper gear is available as an option and provides slowest speed range. Moving the range shift lever to optional creeper (Snail) range provides greatly reduced ground speeds for special operations. SyncShuttle transmission: Gear shift lever provides three forward travel speeds and reverse in the creeper range. PowrReverser transmission: Gear shift lever provides four travel speeds in forward and reverse in the creeper range. 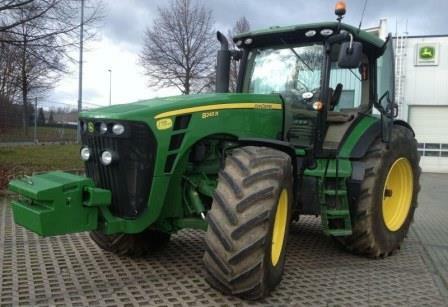 - Before operating JD 5625, 5325, 5425, 5525, 5225 tractor on a road, lock brake pedals together with locking bar. Use brakes lightly and cautiously when slowing from transport speed. - Brake pedals shown in locked position. - Use individual brakes to assist in making sharp turns. Disengage brake pedal locking bar and depress only one brake pedal. - To stop tractor, depress both brake pedals. To prevent unnecessary wear, never ride the brakes by resting a foot on the pedals. 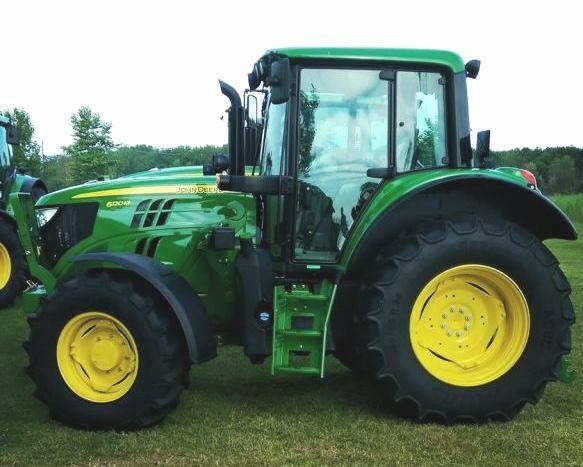 - Reduce speed if towed load weighs more than the tractor and is not equipped with brakes. Avoid hard braking applications. Consult implement operator's manual for recommended transport speeds. - Use additional caution when transporting towed loads under adverse conditions, when turning or when stopping on inclines. 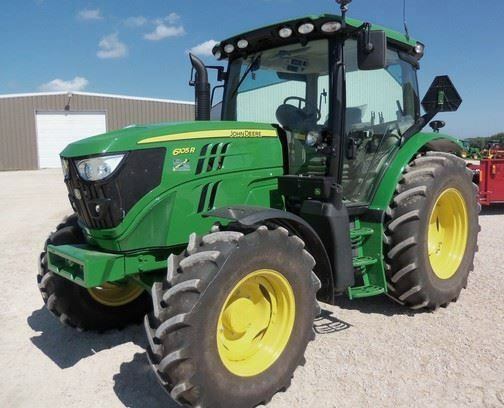 Differential Lock - Dont operate tractor at high speed or attempt to turn with differential lock engaged. To prevent damage to drive train, dont engage differential lock when one wheel is spinning and the other is completely stopped. 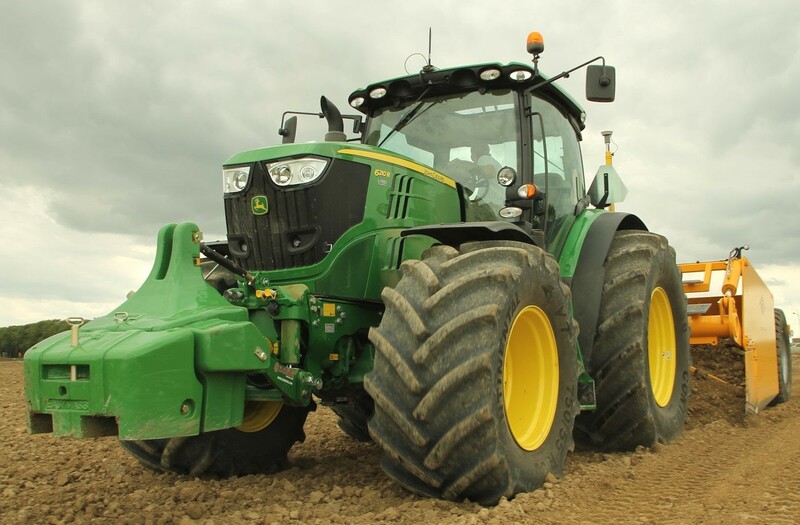 When one wheel starts to lose traction, stop tractor and depress pedal to engage differential lock. 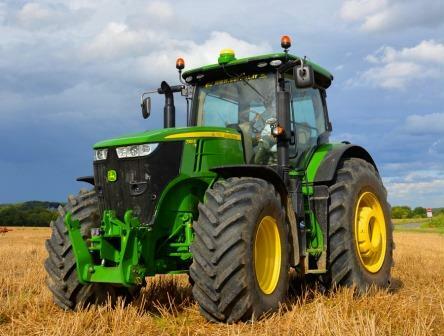 Tractor wheels must be stopped or turning at the same speed before engaging differential lock. If possible, engage differential lock before entering conditions where tires may slip. Unequal traction will keep the lock engaged. When traction equalizes, lock will disengage itself by spring action. If lock does not disengage, depress one brake pedal and then the other. If tires repeatedly slip, then get traction, then slip again, hold pedal down in the engaged position. - Disengage brake pedal locking bar. - Pump left brake pedal, then right brake pedal. The pedals should have a solid feel. If pedals do not feel solid, bleed the brakes. - Check to make sure the pedals do not settle to the end of stroke within 10 seconds after being applied. If leakage exceeds this rate or if one pedal settles faster than the other, see your service. - Press both pedals simultaneously. A solid pedal should be obtained at approximately the same pedal height on both pedals. If height varies more than 51 mm (2 in.) bleed the brakes. Any noticeable pedal drift downward from the point of resistance indicates brake leakage. - A solid pedal and balance between the left and right pedals are important for emergency braking conditions when the locking bar is engaged. - Operate engine at approximately 1000 rpm for at least one minute. - Stop engine and wait an additional three minutes before checking oil level. 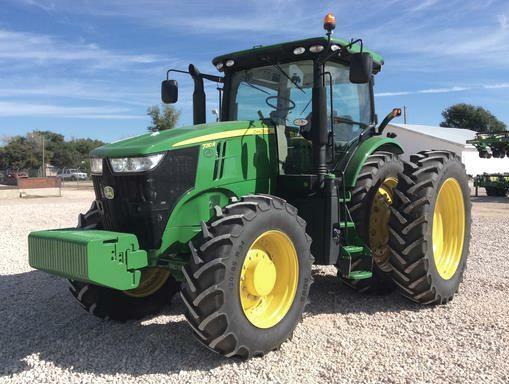 - 5225, 5325, 5425, 5525, 5625 John Deere tractor should be on level ground, hitch in the lowered position, engine stopped and transmission in park when checking oil level. - Oil temperature should be approximately 45C (113F). Sight glass observations will be significantly higher with hotter oil temperatures and lower with colder oil. - Observe oil level in sight glasses at rear of tractor. Oil level should appear at BOTTOM of site glass. - Oil level below top sight glass can result in power loss and heat generation during transport. - If oil level is at TOP of site glass, remove filler cap and add hydraulic oil. - Drain transmission-hydraulic oil. Remove two cap screws and pickup screen cover. - Remove pickup screen and inspect it for damage. Replace if necessary. Clean screen in solvent and blow dry with compressed air. - Inspect O-ring for damage. Replace if necessary. - Carefully install screen so the front of screen is inserted in hole at front of differential case. - Install O-ring, cover and cap screws. Fill system with transmission-hydraulic oil. - Check oil level at sight glass after filling, and again after operating for five minutes. - Measure distance from firewall-to-edge of clutch pedal arm. - Depress clutch pedal (bold arrow) until resistance is felt and measure same distance. The difference between the recorded measurements is clutch pedal free play. If free play is not within specification, adjust clutch linkage. Free Play Distance - 21-25 mm (0.830-0.984 in.). - Remove cover and clip pin. Loosen jam nut. - Push and hold clutch lever forward until resistance is felt. Rotate clevis in or out until clevis and clutch lever holes align. - Move clevis away from clutch lever and rotate clevis counterclockwise 2-1/2 turns. - Align clevis with clutch lever and install clip pin. Tighten jam nut and install cover. - Measure distance from firewall-to-edge of clutch pedal arm. Depress clutch pedal (bold arrow) until resistance is felt and measure same distance. - The difference between the recorded measurements is clutch pedal free play. If free play is not within specification, adjust clutch linkage. Free Play Distance - 21-25 mm (0.830-0.984 in.). - Turn turnbuckle: Counterclockwise to increase free play / Clockwise to decrease free play. Tighten jam nuts. 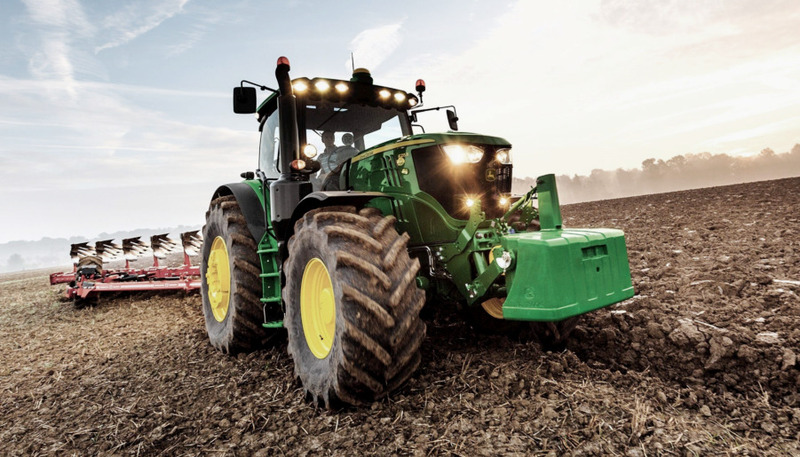 When driving on icy, wet, or graveled surfaces, reduce speed and properly ballast tractor to avoid skidding and loss of steering control. For best control under adverse conditions, engage mechanical front wheel drive (if equipped). To extend tire life, engage mechanical front wheel drive only when needed. Dont engage when driving on hard surfaces. 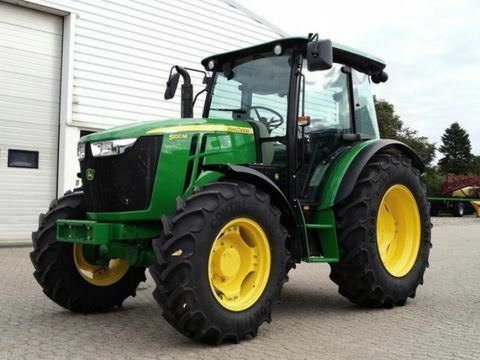 Dont install tire chains on tractor front wheels. Chains will strike and damage tractor. MFWD can be engaged and disengaged in all ranges and gears (forward and reverse) during operation, and under full load. - Depress top end of switch to engage MFWD. Indicator will light when MFWD is engaged. - Depress bottom end of switch to disengage MFWD. 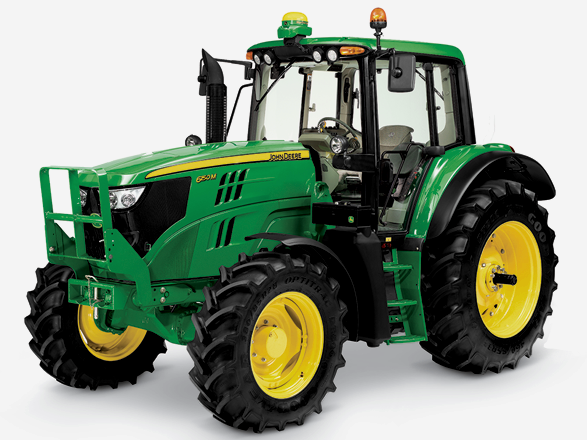 Use AUTO or BRAKE ASSIST positions when transporting tractor, not full time ON mode. MFWD indicator lights whenever front wheel drive is engaged. MFWD can be engaged and disengaged in all gears (forward and reverse) during operation and under full load. - Center ON position engages MFWD full time. - Top AUTO position disengages MFWD automatically when either brake pedal is pressed or if speed exceeds 14 km/h (8.6 mph). MFWD automatically re-engages when brakes are released and speed is below 14 km/h (8.6 mph). - Bottom BRAKE ASSIST position engages MFWD when BOTH brake pedals are depressed. 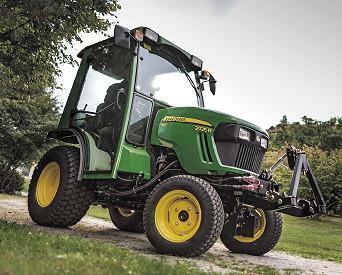 Remove MFWD drive shaft if towing tractor with front wheels on a carrier. 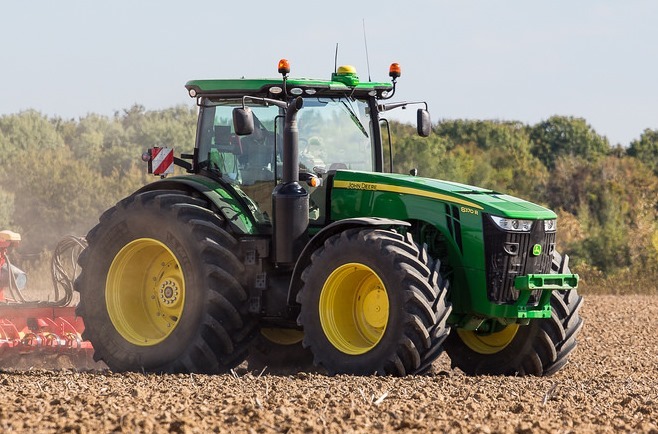 Loss of electrical power or transmission-hydraulic system pressure will engage the MFWD and pull tractor off the carrier, even with switch in the DISENGAGED position. 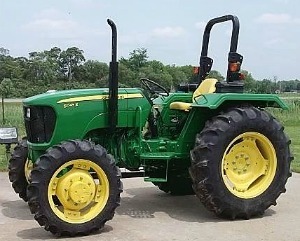 To avoid transmission and drive train component damage, NEVER attempt to start tractor by towing; engine will not start. 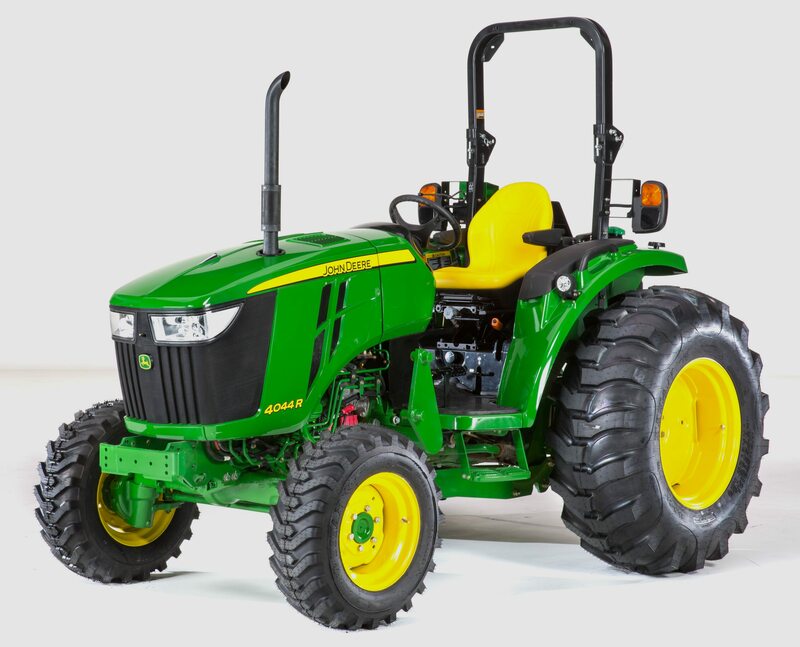 - If equipped with MFWD and towing tractor with front wheels on a carrier, remove drive shaft: 1) Remove three cap screws and slide drive shaft shield away from drop housing. Repeat on opposite end. 2) Remove spring pin using a punch and hammer. 3) Support drive shaft and slide coupler toward drop housing. 4) Remove drive shaft, shields and couplers. - Check transmission-hydraulic oil level (it must be visible in the top sight glass). Add 1L (1qt) for each 90 mm (3-1/2 in.) front wheels are raised off the ground. Dont raise wheels more than 305 mm (12 in.). Drain excess oil after transporting. - Tap brake pedals to make sure differential lock is not engaged. Disengage PTO and move range and gear shift levers to NEUTRAL. - PowrReverser Transmission: Move EH directional reverser lever to NEUTRAL. 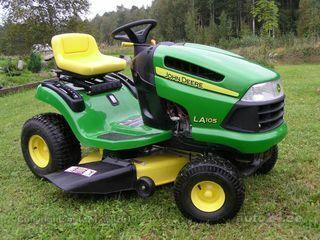 - If possible, operate engine above 1250 rpm to provide lubrication, power steering, and power brakes. Have an operator steer and brake tractor. - Do not tow a tractor faster than 8 km/h (5 mph). Do not exceed 3 km/h (2 mph) for the first 10 minutes in below freezing temperatures. After Towing - If equipped with MFWD, apply multipurpose grease to couplers and shaft splines, and install drive shaft assembly. Drain excess transmission-hydraulic oil to lower level back to full. - Adjustable Front Axle - Lubricate front and rear lubrication fittings with several shots of multipurpose grease. 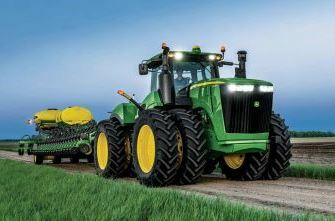 - MFWD Axle-If Equipped - The rear fitting is located on the right side of the tractor. Lubricate front and rear lubrication fittings with several shots of multipurpose grease. 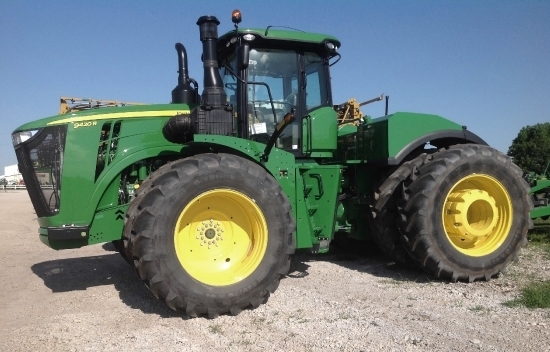 - Park JD 5525, 5325, 5425, 5225, 5625 tractor on level surface. - Remove check/fill plug. Oil level should be even with bottom of the fill plug hole. - If level is low, add oil through same hole. HY-GARD oil is recommended. - Apply pipe sealant with TEFLON, or equivalent, to threads of plug. - Install plug and tighten to specifications. 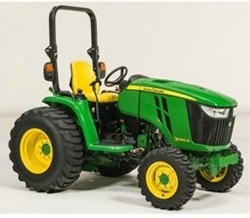 - Park tractor so that oil fill mark on MFWD hub is level with the ground. - Remove fill plug. Oil level should be even with bottom of the fill plug hole. - If level is low, add oil through same hole. 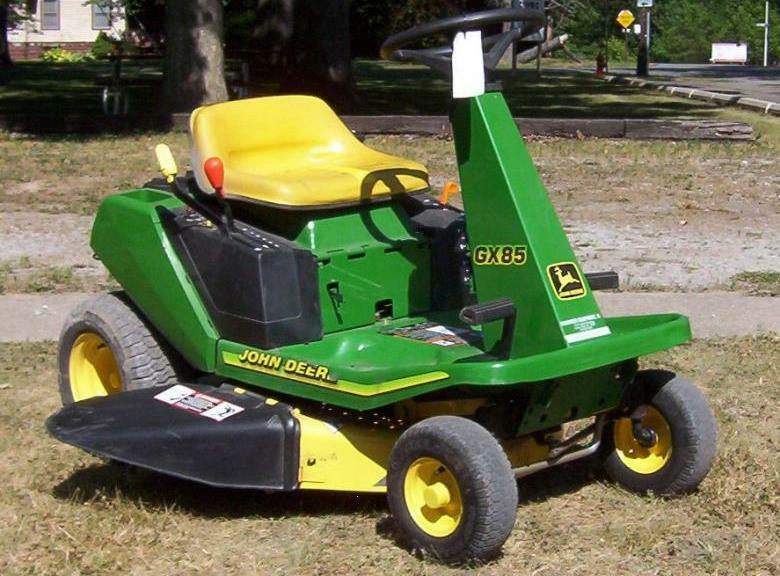 John Deere HY-GARD oil is recommended. - Apply pipe sealant withTEFLON, or equivalent, to threads of plug. 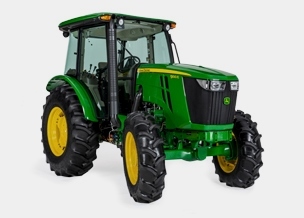 - Raise and support front of tractor so MFWD axle can be oscillated to its stops. - Slowly turn steering wheel to the left until steering cylinder travel has reached its limit, the steering stops, or the tires are within 25 mm (1 in.) of grille screen or side panels. 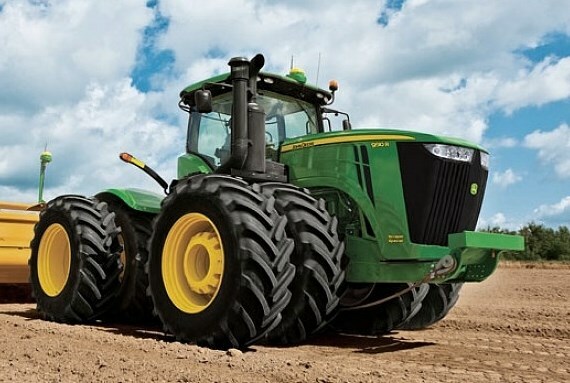 - Raise left side of axle against its stop and measure clearance between tire and nearest tractor component. The distance should not be less than 25 mm (1 in.). - Loosen lock nut on steering stop and adjust steering stop bolt so it touches steering stop. It may be necessary to shorten stop bolt in order to obtain maximum turning angle. - Tighten steering stop bolt retaining lock nut (A) to specifications. Steering Stop Bolt Retaining Lock Nut Torque 125 Nm (92 lb-ft). - Turn wheel fully to the left. Impact knuckle housing to steering stop five times. 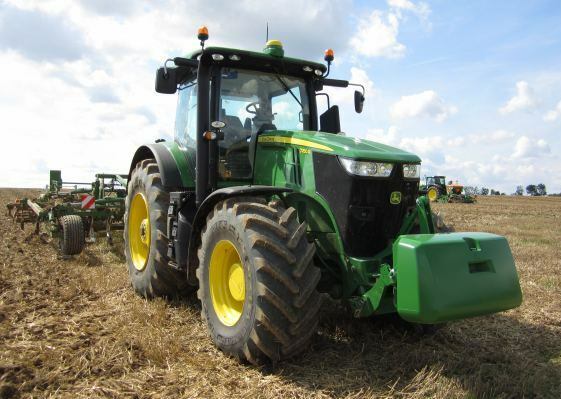 - Park 5225, 5325, 5425, 5525, 5625 John Deere tractor on level ground, place transmission in park, turn off engine and remove key. Block rear wheels. - Jack up front end of tractor. 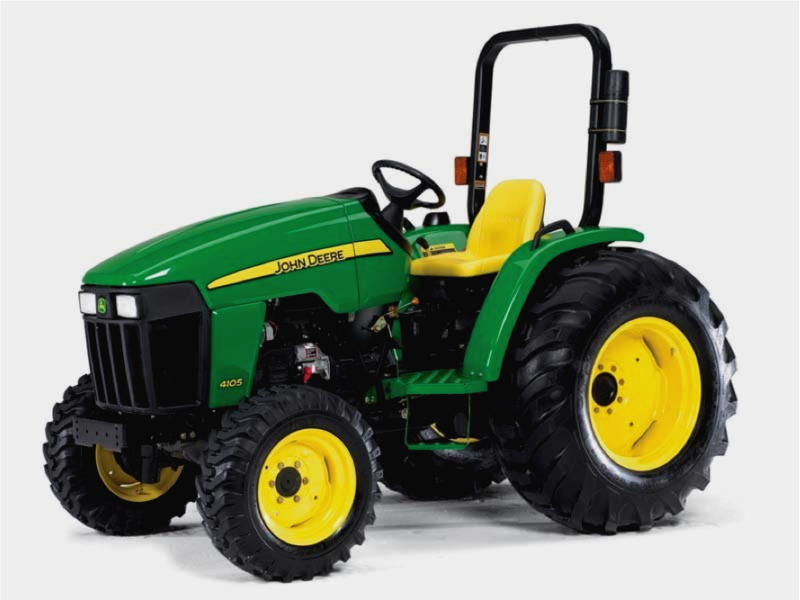 Support tractor securely on stands before removing a wheel. - Remove hub cap, cotter pin and wheel nut. - Remove washer and wheel bearings. Clean all parts in solvent and blow dry with compressed air. Replace any worn or damaged parts. - Pack bearing with multipurpose grease. Coat seal with grease. Install bearings, washer and wheel nut. - Tighten wheel nut until a slight drag is felt when hub is turned. Back nut off just enough to install cotter pin in hole in wheel spindle. - Install hub cap and wheels. Tighten lug bolts to specification. - Tighten bolts again after driving tractor 100 m (109 yd) and again after three hours and 10 hours of use. - Park machine on level surface. Turn steering wheel so front wheels are in the straight-ahead position. Stop engine. - Measure distance between tires at hub level in front of axle. Record measurement and mark the tires. - Move tractor back about 1 m (3 ft), so mark is at hub level behind the axle. Again, measure distance between tires at same point on tire. Record measurement. - Determine the difference between front and rear measurements. If the front measurement is smaller, toe is in. If the rear is smaller, toe is out. - Distance at front of tires should be 3-6 mm (1/8-1/4 in.) less than distance measured at rear of tires. Adjust toe-in if necessary. - Disengage MFWD and park tractor on smooth, level surface. Steer front wheels straight ahead. Stop engine. - Measure distance between centerline of tires at hub level in front of axle, using an outside bar of each tire or an inside bar of each tire. Record measurement and mark the tires. - Determine the difference between front and rear measurements. If the front measurement is smaller, toe is in. If the rear is smaller, toe is out. The difference may be in either direction (toe-in or toe-out), but should be less than 3 mm (1/8 in.). Adjust toe-in if necessary.